"How will the Führer die? How long will he live?" When I answered these questions and pointed out that Hitler would not die at the hands of an assassin, Himmler either pulled a wry face and grew serious or else sat with an expressionless, unctuous, bland smile on his face, which was quite out of keeping with his personality. But despite my warnings, Himmler chose to wait for an assassination attempt. His idea was that if such an attempt was made and Hitler was killed, then he would not have to go through with his own projected coup d'etat, which had been discussed in April and May. With the intelligence summaries in his possession Himmler was able to play politics. As far as we were concerned, however, all this meant was that instead of taking action, he vacillated and continued to play his double game; he hesitated out of fear and so lost precious time. After the unsuccessful attempt on Hitler's life of July 20, 1944, I was told by Dr. Goverts-who was in close contact with Gero von Gävernitz, an official on the staff of Allen Dulles at the Office for Strategic Services at Berne -that Polish Intelligence had known about Stauffenberg's plot on July 10, when it was asked to report on the reaction of the Polish and Ukrainian resistance movement in the event of a coup d'etat in Germany. From this it followed that Schellenberg might well have been informed about the plot by other contacts as well. For the German opposition at that time this was a very important consideration. The fact was that Schellenberg and his department had had prior information concerning the projected putsch which they had not acted on. And since Schellenberg was an intimate friend of Himmler, it is inconceivable that he should not have discussed this matter with him. Schellenberg had often complained to me about the lack of zeal displayed by his agents and the scantiness of their reports. Above all, he said, he lacked good, direct contacts with English and American politicians. On one such occasion I suggested to him that if he were agreeable, I could put him in touch with a reliable and suitable person who was in a position to make such contacts for him. It would not be difficult, I said, since the man's mother was an Englishwoman and was on friendly terms with the wife of one of the leading English politicians. Schellenberg was enthusiastic and urged me to arrange an early meeting with this man, who was no other than my friend Dr. Henry Goverts. When I approached Goverts, he told me: "If my constellations are favorable, I will do it." His constellations were favorable! I then arranged the meeting between Schellenberg and Dr. Goverts. It seemed to me that the Hartzwalde estate was the most suitable place, because this would enable Goverts-who was anxious to discover whether the SS had had prior information concerning the assassination plot of July 20-to make contact with both Schellenberg and Felix Kersten. The private talk between Goverts and Schellenberg was engineered by Felix Kersten immediately after lunch on the day of our arrival. While conducting his numerous guests on a tour of the estate, Kersten suggested, as we were approaching the pigsties, that Schellenberg and Goverts should go on ahead since they had already seen the sties. On his walk through the Hartzwalde woods Dr. Goverts was informed that the SS had known nothing about Stauffenberg's assassination plot and had been taken completely by surprise. The contact between Schellenberg and Dr. Goverts became very close and cordial. On July 22, two days after the assassination attempt, Felix Kersten telephoned me and passed on a number of urgent tasks from Himmler which had to be executed at once. They concerned Hitler's current state of health and the consequences of the assassination attempt. Kersten was so excited that his secretary had to finish the conversation for him. He wanted me to come to Hartzwalde immediately. Kersten was then living in fear of his life, for he too had been involved in the July 20 plot; the resistance leader Dr. Langbehn had been arrested before July 20, and now his friend Wentzel von Teutschental had also been imprisoned by the Gestapo. As soon as he saw me, Kersten asked whether he himself was in danger and whether he ought not to return to Stockholm. I reminded him of my astrological forecast-he was in no danger whatsoever. 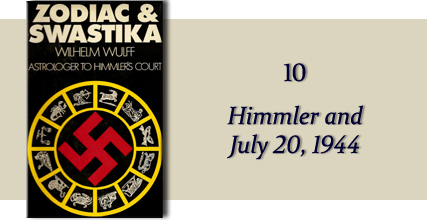 The evening before our meeting, on August 12, Kersten had returned from a visit to Himmler. "The Reichsführer himself has been placed in a very difficult position as a result of this assassination attempt," he said, "and wants you to check his horoscope for him. I shall be seeing him again in a few days time. He wants to know how this affair will turn out for him. And then you really must deal with my own horoscope in detail. This crazy business will get us all into trouble!" After July 20, Himmler had had a temporary change of heart about his idea of a coup d'etat because he was afraid of losing his position. But by the beginning of November, 1944, he was again pursuing his former plans, as is well illustrated by a commission which Dr. Henry Goverts received from Schellenberg. Schellenberg asked to see Goverts again under the pretext of discussing the defense of Hamburg. After I had chosen a favorable day for Goverts, he traveled to Berlin accompanied by an SS Captain. This officer was not present at their talks, which Schellenberg preferred to conduct in private. Schellenberg had contracted an inflammation of the lung and received Goverts from his bed, dressed in a bluetrimmed nightgown. Hamburg's military situation had been a pretext. Schellenberg referred immediately to Goverts' contacts with Gãvernitz and Allen Dulles. He regarded the war as lost and wanted Goverts to arrange a meeting between Dulles and Himmler on a steamer in the middle of Lake Constance, in the hope of salvaging something from the wreck. From the end of 1943 on no clear-thinking and unprejudiced observer of the military and political situation in the Third Reich could fail to observe that Hitler was going to lose the war. At that time the German Army was desperately defending itself in Russia against the massive onslaught of the Soviet troops, after the Siberian divisions had been moved from the border of Manchuria. Hitler lost one battle after the other. Mussolini was finished by 1943, and although the Badoglio government was still being propped up by Hitler, it had no real authority of its own, and Fascist power in Italy was completely broken. But although the Italian troops were going over to the Allies in hordes, until such time as Rome passed into Allied hands, 'ltaly was occupied by the Germans," and Himmler was not prepared to admit that his splendid SS troops were being worsted time and again. During that period the people in Himmler's entourage were only allowed to speak of victory. Even the junior officers and NCO's received a directive to this effect. Notwithstanding this ruling, the news which Schellenberg continually brought to Himmler was positively shattering. The invincible German Army was suffering one defeat after the other, and thousands and thousands of troops were falling into the hands of the Allies. From 1944 on German losses were counted in millions. The intelligence reports became more and more depressing, and after November 3, 1944, the tension was intolerable. Goverts traveled to Switzerland to put out peace feelers*. In the Rom Inselhotel at Constance he conducted preliminary negotiations for the Himmler-Dulles meeting, which subsequently failed to materialize because I Himmler once again backed out through fear for his personal safety. *	He had already shown how good his contacts were on a previous occasion when he had brought back a Gestapo pass-which had been produced in England-for the ambitious Dr. Gisevius. Schellenberg's men-security officials-interrupted me in my astrological work with new tasks and insisted that I should give them priority. At that time I already had work in hand from Himmler-which was due on November 15 and which I had not even started. During November Dr. Goverts needed to talk to me very often. Toward the end of the month it became clear that the military situation had grown incredibly confused. There were serious shortages of weapons and ammunition at the fronts. Gasoline supplies were cut, and there was, consequently, insufficient transport; railway cars had been destroyed en masse. The large reserves of stores which had been laid up in France-huge arsenals stretching all the way to the Somme-had fallen into the hands of the Allies, whose air forces had doubled by November, 1944. And all the time Schellenberg's emissaries and couriers were pressing for completion of the special astrological calculations for this complex political and military situation. When we saw Berlin, we realized that one of the future projects planned by the German government-namely, the demolition of our big cities-would actually be completed before the war was over. The effects of this action were brought home to us in no uncertain terms. Unfortunately the task was accomplished for the Nazi leaders by the Royal and U.S. Air Forces. Kersten talked about the bombing: "What do you think they told me at headquarters, Herr Wulff, when they received the reports on the destruction in the residential quarters? They said that everything possible was being done to minimize the effects of the air raids and to protect the population: 'If at the present moment one or even several of our big cities should be destroyed, this would be regrettable but unavoidable and the population would have to bear their burden quietly and patiently.' Their 'present moment' has been going on for three years, but Himmler considers that the Germans are a strong and hardy race, who just don't care if fifteen or twenty million people lose their lives in this war." He was right. The Hitler regime simply turned a blind eye to such considerations. "But what about the bombed cities in the West, Cologne, Bochum, and Stuttgart?" I asked. "What do they say about them at headquarters? How do they propose to make good the damage?" "My dear Herr Wulff, you have no idea! The people at headquarters look upon Cologne as a hideous old city with dreadful old houses and narrow streets and obsolete public amenities. It doesn't matter at all if old Cologne is destroyed. Most of the buildings are worthless anyway, and after the war Cologne will be rebuilt-far better and far more beautiful-in accordance with the concepts of National Socialist culture and true to the spirit of our great Führer. These dirty, soot-laden old cities like Cologne and Düsseldorf can disappear from the face of the earth for all they care, my dear fellow. You cannot imagine the sort of things that are being said about the heavy raids on the big cities. Incidentally, they have exactly the same attitude toward Hamburg." I then pointed out to him that Hamburg was not an ancient city like Cologne, Mainz, or Cassel. The major part of old Hamburg was burned down in 1842. Later, in the 1880s, the city was redeveloped and a number of splendid buildings were put up by wealthy old Hanseatic families. "These claims are both false and stupid," I said, 'and merely demonstrate the ignorance of these men at headquarters of the city's history. The Monckebergstrasse, the Steinstrasse, the districts of Barmbek and Dulsberg, and many other parts of the city were new developments. Most of them have been destroyed, and since both Germany and Hamburg will be impoverished after the war, it seems unlikely that these districts will be rebuilt in their former splendor, with durable and costly materials. I am curious to know how the Nazis envisage postwar reconstruction." We were driving through the Hohenzollerndamm district which consisted largely of new buildings that had nearly all been destroyed. Kersten said sadly, "No old houses, just trash! You know, according to the people at the Führer's headquarters, all the old buildings on the Hohenzollerndamm were just tasteless rubbish."